Suppose your company has one SQL Server that has hundreds of databases which are accessed by different application. Over the time the numbers of Databases are increased on this server and hurting performance. Your company has made decision to purchase a new SQL Server. 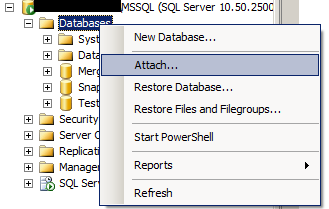 They want you to move (migrate) some of the databases from current SQL Server to new build SQL Server. Detach database from current SQL Server Instance. Before Detaching database run below query to get location for mdf and log file. My folder location for MSSQL SQL instance is below. This is the instance where we are going to attach our database. Please note that I am using the same folder for mdf and ldf files but that is not best practice. You will be using different Drives for mdf and ldf. Once the mdf and ldf files are copied to the required folder. Let's go to SQL Server Instance where we want to attach the database. Navigate to the location where you have copied mdf file for your Database and Choose mdf file as shown below. Once you hit Ok, it is going to take few seconds to attach database to SQL Server Instance. TEST_PUB is successfully attached to MSSQL SQL Server Instance.